Do the gutters on your home have unsightly vertical streaks running down them? These stains are commonly known as tiger stripes, and they are often caused by some combination of tree sap, chimney fumes and environmental pollution. 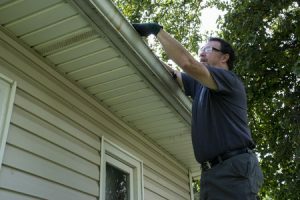 Removing tiger stripes from your gutters may be challenging, but they can be cleaned effectively if you’re willing to put in the time and work. Here are a few tips that will help you make those streaks a thing of the past. Start by using a non-abrasive detergent cleaner. The first thing to do when you notice tiger stripes on your gutters is attempt to clean them with a non-abrasive detergent cleaner. There are a number of companies that manufacture cleaning products designed specifically for gutters. These products can usually help you eliminate tiger streaks right away as long as they haven’t built up on your gutters over the course of many years. Try a heavy-duty cleaner for tough tiger streaks. In cases where tiger stripes have had more time to develop, a non-abrasive cleaner may not be powerful enough to remove them completely. In that case, you’ll need to try using something that packs a bit more of a punch. A cleaning product like Fantastik All Purpose Cleaner might just do the trick. Avoid cleaning your gutters with anything that might damage them. You may have to get creative to remove tiger stripes from your gutters, but you shouldn’t use anything that might damage them in the process. Avoid ammonia, paint removers or anything that has potentially-harmful solvents in it, for example. You should also use soft brush or a cloth rather than metal brushes to avoid scratching your gutters while cleaning them. If you’re tired of trying to restore your dingy old gutters, we can help you replace them with modern, durable seamless gutters that will improve your home’s curb appeal and look great for many years to come. Give us a call or contact us online to get started today!